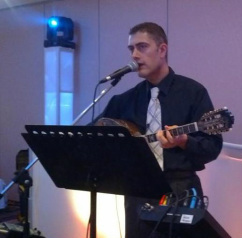 Nikos is the Bouzouki Player/Singer and Dj. He began playing Greek music at the age of 10 and has performed with many various famous Greek Musicians in Greece and North America. He has an extensive repertoire and a thirst to provide top quality entertainment to his clients. He is known as a great soloist as well able to read and understand what his audience and clients want to listen to. He has very impressive Dj and mixing skills and has build a repertoire of Greek and English Music like no other. His famous quote is " Each venue we do is unique we want to write a story and leave our clients talking about their experience for weeks. If we can accomplish this than our work is truly done". Bill is the Keyboardist and Dj His love of Greek Music began at the age of 12. He has an extensive knowledge in Dimotika, Laika as well Northern Greek Music. He has worked with with many Greek Musicians in Greece and in Canada. His famous quote is " I strive to provide the best music and best quality services to my audience and clients so that I can leave them speechless and in awe. If I have done so, then I know Seizmos has fulfilled their job".